[9th November 2016] EcoWorld Ballymore, one of London’s most prominent property developers, today declares London City Island open and officially announces the arrival of the island’s first restaurant tenant, The Island Grocer by Ballymore. The Island Grocer by Ballymore, will provide a grocery and restaurant for residents and the surrounding area. It is the vision of Sean Mulryan, Chairman and Chief Executive of Ballymore to recreate this initiative across other developments. The independent, artisan Island Grocer will set the benchmark for the retail and leisure spaces across the 12 acre site. The concept for The Grocer is unique, a one-stop-shop comprising an espresso bar, deli restaurant and grocery store. It will provide residents, and the local community, with a social hub and destination for morning coffee, lunch, a glass of wine or pizza and Italian tapas. In addition, the grocery store will provide somewhere for residents to pick up their daily essentials. Designed by Amos & Amos, the interior seamlessly merges the retail and restaurant offer. 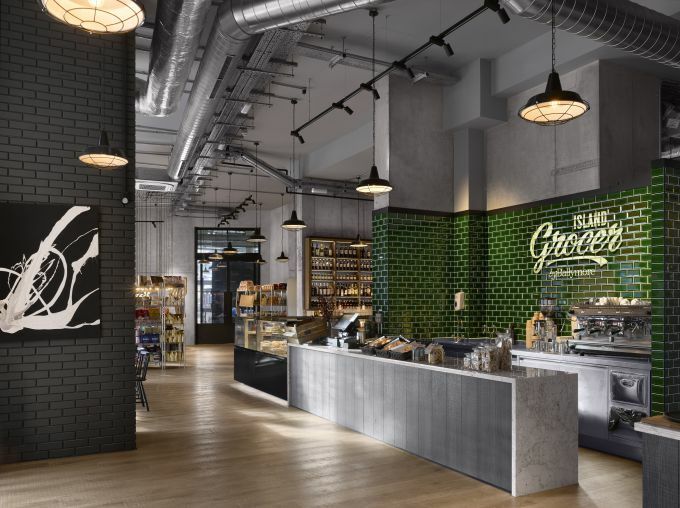 The grocer exhibits a series of tough metal shelving units set against a concrete backdrop and clustered around a central display table under a collection of filament pendants offering fresh produce, baked goods and dry store items. The sweeping bar sits in front of an open chef’s table, with an arabescato bartop sitting over a rough-cut oak veneer base, reminiscent of dockside timbers found on the site. Following the line of the bar a large chilled display unit is home to smoothies, cheese, fish, meat and deli sandwiches. At the rear of the space the restaurant seating is located along deep navy leather banquettes with a ribbed backrest, pale green chairs and white marble dining tables. The materials in The Grocer and tough and true to their east London location, the green tiles in historic Victorian green are set against hexagonal black and white classic bistro floor tiles. Bespoke oak tables sit at the front of the space – designed specifically for the Island Grocer – constructed from solid antique oak and fixed to blackened steel legs with oversized blackened steel bolts. The barstools at the window bar are similarly bespoke – tan leather seat pads with polished brass footrests. At either end of The Grocer, oversized metal crittal doors lead into the space. The new neighbourhood will deliver 1,700 new homes and will create a new island neighbourhood on Leamouth Peninsula. Known as the ‘mini Manhattan’ of London, London City Island boasts a 260ft iconic red bridge, built by Ballymore, to link the development to Canning Town, the development is one of the best connected developments in the Capital with fast access to Canary Wharf (4 minutes), the West End (Bond Street in 20 minutes) and the City (London Bridge in 11 minutes). A new creative and vibrant island metropolis, London City Island will be a destination of culture and contemporary living. This announcement coincides with the announcement that the London Film School will be moving to the Island, furthering the area’s creative offering and following the announcement last year that English National Ballet and English National Ballet School will make their home on the island in 2018.